Antigua and Barbuda is celebrating “a phenomenal performance” from one of its brightest stars. 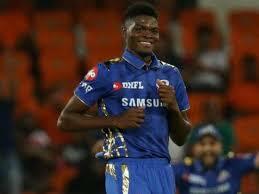 Prime Minister Gaston Browne today joined in congratulating Alzarri Joseph on his “historic and astonishing” debut in the IPL series, claiming six wickets for 12 runs, claiming the best ever bowling figures in the eleven year history of the league. “Alzarri has proven that he has the talent and exceptional determination to succeed in the game of cricket,” he said. “He has made all Antiguans and Barbudans proud and has set his sights on emulating the exploits of the great Curtley Ambrose and Andy Roberts. We are indeed very proud of his performance and anticipates greatness from him as the series progresses. ” PM Gaston Browne.